Foodservice Beverage Dispensers are helpful in restaurant buffets and catering for allowing self serve drinks. Our commercial Beverage Dispensers from Cambro are quality pieces of restaurant equipment that last for years in the commercial foodservice industry. Trust the restaurant supply superstore for your restaurant equipment wholesale Beverage Dispensers for water, lemonade, tea and more. Tablecraft Translucent Beverage Dispenser Black - 5 Gal. Tablecraft Plastic Beverage Dispenser Yellow - 3 Gal. Tablecraft Plastic Beverage Dispenser Black - 3 Gal. Update International Black and Gold Traditional Beverage Dispenser - 20 Oz. Update International Black and Gold Traditional Beverage Dispenser - 32 Oz. Update International Black and Gold Traditional Beverage Dispenser - 64 Oz. Carafe Black Swirl Push Button - 42 Oz. Carafe Stainless Steel Premium - 1.0 Ltr. Tea Dispenser - 5 Gal. Carafe Decanter - 6.5 oz. 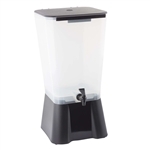 Wholesale Beverage Dispensers are a valuable asset to any restaurant buffet or caterer.